The TLR Coaching Insights programme has been designed for coaches and by coaches to help get developed and developing practitioners out of their sport-based silos and into contact with other like-minded people to learn, challenge, be challenged and network. The format is simple: three hours, four speakers from elite to grassroots sport, from business and from academia with time for networking built in. The target audience is Level 2 coaches and above along with their managers and educators in full-time, part-time and voluntary roles. 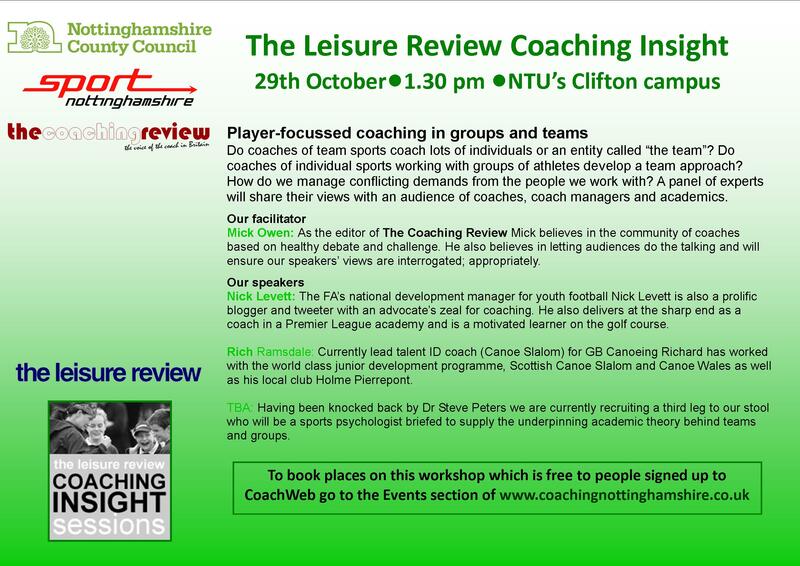 The next Coaching Insight session is scheduled for Tuesday 29 October at Nottingham Trent’s Clifton campus. Starting at 1.30pm, this event will investigate the differences between coaching teams of individuals and coaching individuals in groups. The session will last until about 4.30pm and offer extensive opportunities to discuss and debate sports coaching with highly experienced coaching professionals and fellow coaches seeking to develop their own coaching careers. 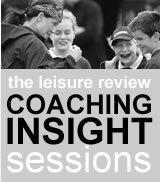 In recent years The Leisure Review Coaching Insight sessions have established as a highly effective element of continuing professional develop for coaches looking to expand their understanding of the coaching process beyond the confines of their particular sports. For full details of how you can be part of this event contact Mick Owen at The Leisure Review. Download the official flyer for this event. Described as "tech-savvy", "achievement-oriented" and "attention-craving", today's young adults, whatever their background, challenge their coaches to work in a world where the athletes' needs and expectations and the pace of change are just part of the challenge. When he retired last year David was a visiting lecturer at both Liverpool John Moores and Sheffield Hallam universities and he has a wealth of experience working with adults. Busier now than ever, he is a leading thinker, writer and speaker on sports coaching and will help our audience of coaches from all corners of the coaching world explore the issues. An international player in both codes of rugby, B-J now works for the Rugby Football League as their head of player development, a role in which he manages the expectations of the nation's most promising young performers. Street Games changes lives and communities by bringing sport closer to home for disadvantaged communities. As their training & NGB relationship manager, Justyn will explain how “doorstep sport” is changing the lives of young adults across Britain. Inspiration is 99% preparation and 1% luck: is this true in coaching? The Olympic strapline “Inspiring a generation” and the post-2012 bulge in participation have conspired to put pressure on coaches at all levels to add “inspiration” to their coaching toolbox. We’ll explore the concept with expert speakers and an audience of coaches to assess its validity in a variety of coaching contexts. Presented on 28th February 2013 with speakers Richard Cheetham, Nick Scott and Justyn Price. A report of this event can be found in in the Feb 2012 issue of The Leisure Review. Sitting at the feet of giants: what can we learn from the coaches of elite performers? A report of this event appears in the November 2011 edition of TLR. Coaching: profession, vocation or business opportunity? The demand for sports coaches in schools, commercial and governing body programmes and the Olympic legacy sector has meant more coaches are getting paid more often, but are they getting more professional? This seminar heard from commercial coaching companies, advocates for the professionalisation of coaching, governing bodies that need to help coaches adapt to the modern world, and leading academics. This event explored the supposition that If success in sport is “the accumulation of marginal gains” the need to innovate should be a major driver for coaches, coach educators and coach managers. However, reliance on tried and tested methods, a watch-me-then-you-do-it approach to coach training and the dreaded tick box mentality which percolates into coaching from our friends in sports development all erode the will to experiment. Our speakers were John Mills leading coach educator for British Cycling and the UCI, Ian Thompson coach development manager for the RFU in the North West and David Haskins Visiting Fellow at both Liverpool John Moores and Sheffield Hallam universities but the key ingredient was the coaches in the room. A report of this event is available in the June 2011 issue of The Leisure Review.